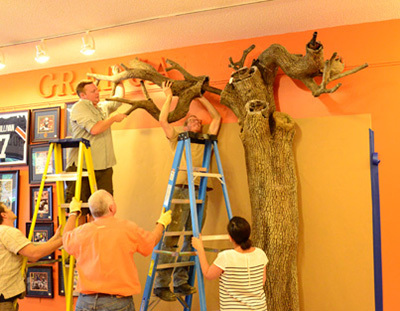 The spirit of the Toomer’s Oaks will live on inside Auburn Art thanks to a lifelike tree sculpture commissioned by Auburn Art owner Cliff Hare. Once upon a workshop, sculptures (and ‘Transformer type technology‘) were a very real and very considered possibility to replace the Toomer’s Oaks. Real tree proponents prevailed, but that didn’t stop Auburn Art owner Cliff Hare from commissioning his own Toomer’s Oak sculpture. 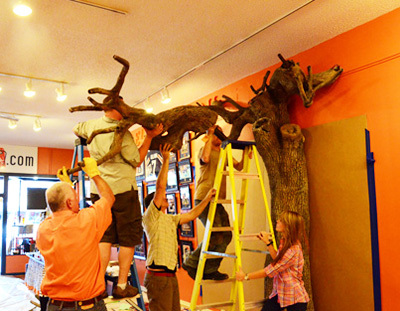 Hare contracted with California-based company NatureMaker, which specializes in engineering handcrafted architectural trees, to create an in-store Toomer’s Oak sculpture. NatureMaker artist Bob Jones actually began work on the project five months ago. 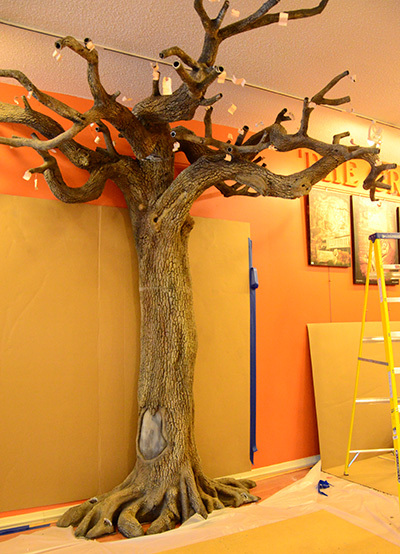 Jones traveled to Auburn this week and will spend Tuesday installing the tree, and will complete the project Wednesday by sculpting and painting the tree’s seams. “My initial effort was to make the tree as accurate as possible based on the photos Cliff sent.” Jones said. Judging by early photos, he succeeded. 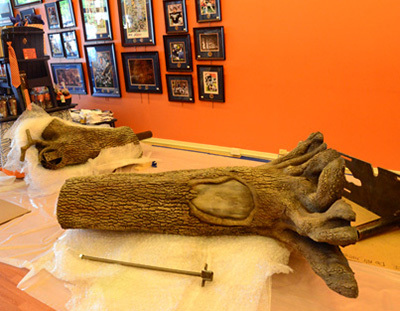 The design of the sculpture, which is based off of photos of the oak that was closest to College Street, includes even the scar from when a car crashed into the trunk several years ago. NatureMaker installations can be found across the United States and even internationally, including countries like Dubai, China, and Russia. Hare believes visiting the lifelike sculpture will become another way Auburn fans can remember the Toomer’s Oaks. “It provides another opportunity for the Auburn family to stand beneath the iconic oaks,” he said.